Patrick Durr Associates has successfully legitimised a commercial property near Goudhurst, under Tunbridge Wells Borough Council, following a two-part process. The applicant approached us following a planning enforcement report that commercial use of former agricultural buildings was taking place without planning permission. We visited the application site and noted all uses, as well as the history of property. We were quickly able to establish that most of the commercial uses at the site were in fact lawful due to the passage of time. A change of use of land or a building from one use to another can become lawful following a continuous period of ten years, and if no Enforcement Notice has been issued at the site preventing the said use. Sometimes, applicants or the Council will ask for this use to be confirmed by way of a Lawful Development Certificate (Existing). This analyses the evidence supporting the alleged change of use and if permissible, presents an official confirmation Certificate. This is akin to granting retrospective planning permission, but without any planning conditions. Consequently, we submitted a Lawful Development Certificate (Existing) to confirm the commercial uses which were lawful. This was an important application as there were tenants in situ, which would have been made to leave if the application was refused. For any Certificate application, it is vitally important for the planner to present the evidence correctly, and in full, to increase the chances of a successful application. Fail to prepare and prepare to fail is an apt motto for such submissions. 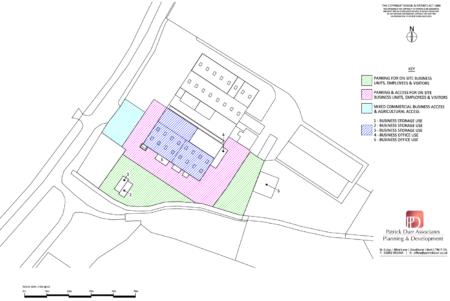 As well as submitting an application to confirm the existing lawful use of the site, we also had to submit a standard, retrospective planning permission for a new officer block and ancillary development, which had not reached its lawful immunity period. For this retrospective application we had to ensure that the development accorded with both local and national policy as much as possible. Fortunately for the benefit of the property, its tenants and the local economy, all applications for the site were approved by Tunbridge Wells Borough Council. It is not always about residential applications! Please Contact Patrick Durr Associates if you have a similar property that you would to regulate, or indeed if you have a site looking to diversify into a commercial business.